An iOS puzzle platformer, Babylonian Twins is actually rooted in the Amiga personal computer line. It was originally developed for that platform, but it didn’t get to see the light of day as a consequence of the collapse of the once mighty Commodore. 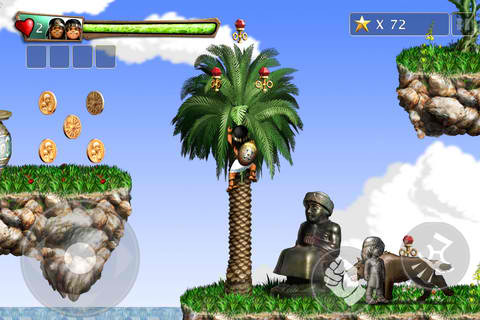 Fast forward to 2010, the original team behind the video game’s development resurfaced to make the Babylonian Twins game for iOS as we know it today. Well, not quite, since just yesterday the game’s developer, Cosmos Interactive, succumbed to the freemium business model after having rebranded Babylonian Twins exclusively as premium. To be fair to Cosmos, the freemium Babylonian Twins is available as a separate game, independent of the premium flavors of the game. Before yesterday, only two Babylonian Twins titles existed in the App Store:Babylonian Twins Premium for iPhone and Babylonian Twins HD Premiumfor iPad, available in the App Store for $1.99 each. Now, a new title has emerged: Babylonian Twins Puzzle Platformer, available for free. Notice how the addition of “Puzzle Platformer” instead of “Free” or “Lite” to the name of this new Babylonian Twins variant seems to downplay its nature as a freemium game. Again, to be fair, the developer of the game points out that you can unlock all levels in the game without having to purchase coins provided that you perform particularly well in the game. Nevertheless, the developer seems to encourage making purchases for extra coins, saying that it “will make your life easier.” These purchases are said to go towards supporting the game. This last remark is quite telling. If you look at the change logs for either of Babylonian Twins’ premium titles, you’ll see that it’s just a series of alternating price increases and decreases. And other than the single instance of a minor update for the iPhone version, either log is conspicuously devoid of updates. A considerable price drop can draw attention to an otherwise overlooked game. And once significant attention has been captured, a price increase becomes the order of the day. The lack of a major update, which naturally calls for additional funds, may be an indication that this strategy isn’t doing wonders for Cosmos. Its last resort? Try its luck with the freemium model. What baffles me, though, is that the game is free supposedly during the launch period only. Go figure. In addition to being Babylonian Twins’ first foray into freemium, Babylonian Twins Puzzle Platformer is also a universal app. In a sense, it’s like an alloy of Babylonian Twins Premium and Babylonian Twins HD Premium made “slightly” different and ultimately gilded with bits of freemium dust.